This web site on Mildred M. (née Mayer) Vitello is under development. We welcome your input, stories, photographs, documents, and other resources. Mildred Mayer was born on February 1, 1915. Mildred married Charles H. Vitello. Mildred died on February 9, 1998. She was interred on February 11, 1998, in Plot 12 0 170 at Quantico National Cemetery, Prince William County, Virginia. Elizabeth (née Schwert) Mayer: Born 1886; died 1969. Arthur Mayer: Born 1890; died 1939. 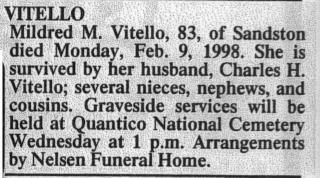 Obituary: Mildred (née Mayer) Vitello, died February 9, 1998, Sandston, Virginia. Interment Records: Mildred (née Mayer) Vitello; born February 1, 1915; died February 9, 1998. Interred on February 11, 1998, in Plot 12 0 170 at Quantico National Cemetery, Prince William County, Virginia.